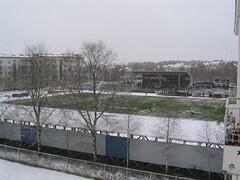 RoPS were relegated on Saturday after playing a 1-1 draw against Vasa at home. The game was played on the day of our first real snowfall of the winter, which must have made things interesting on the pitch. Unfortunately for our boys, even the Arctic conditions weren't enough of a homefield advantage to keep us in the top division. Posted on October 25, 2005 by Scott Forrest and filed under Finland.